"The insides of my shorts are now the same colour as the road but I'm OK!" 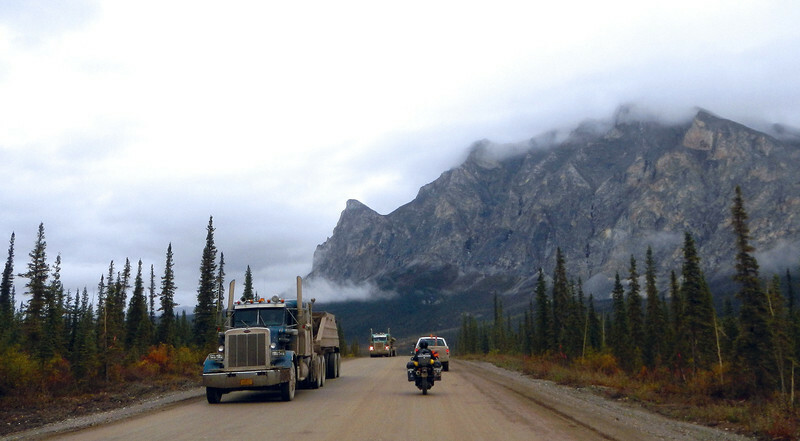 The Dalton Highway was built especially for truckers hauling material all the way up to Prudhoe Bay to build the Alaska Pipeline. It's also called the Haul Road, and today is used to carry supplies to Deadhorse, where all the work is done extracting the crude out of the oil fields. Trucks are the undisputed King of the Road and riding amongst them requires special attention. The biggest danger is getting hit by rocks and stones kicked up by any one of the 18 wheels passing you by at close proximity. The speed limit on the Dalton is 50mph and it is not uncommon to see rocks hitting your windshield and visor at closing speeds of a plastic-shattering 100mph. The common wisdom is to always pull over when you see a truck approaching, turn your helmet to the side of the road and duck behind your windscreen. We're told that in the dry summer months, you can see a truck approaching for hundreds of metres away due to the dust cloud in the distance. 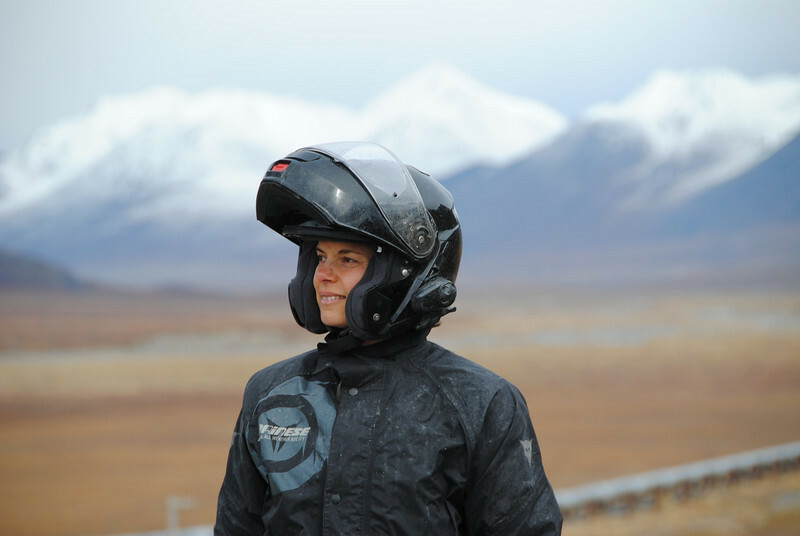 Today, the dust clouds are replaced with a head-to-toe mud bath, sometimes temporarily obscuring your visor if you don't get your head turned away in time. 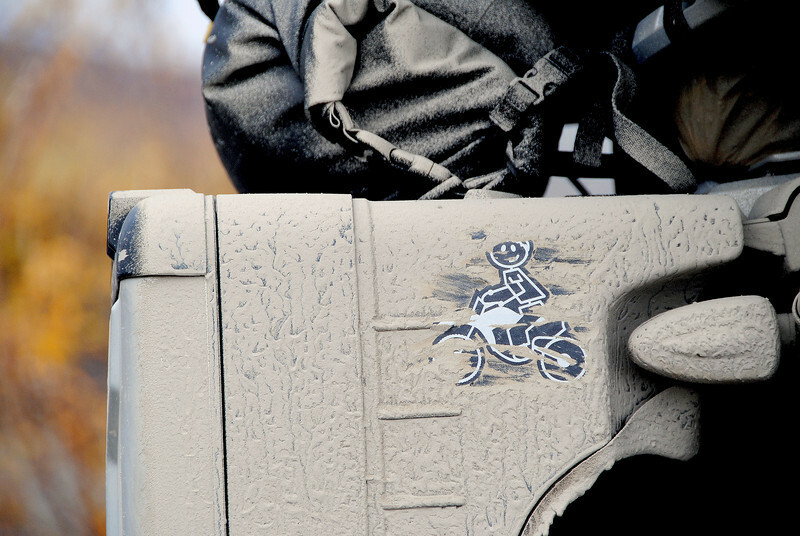 Don't even think about smearing the mud with your already dirty gloves, so you're riding blind until you can get stopped to pull out a clean-ish rag.... "DON'T GET ELIMINATED!" Rain and thick fog still fail to mask the brilliant autumn colours in the flatlands. The trees become more sparse the further north we travel, as the environment is getting more inhospitable to anything shorter than ground vegetation. 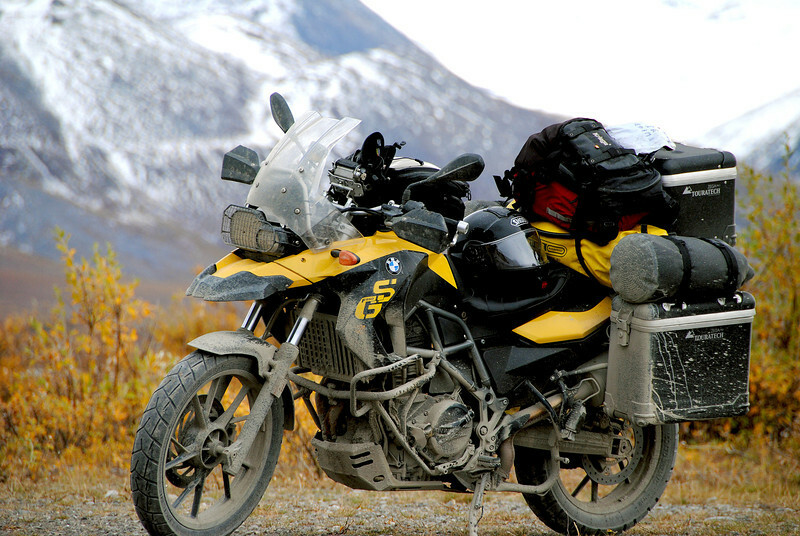 Stretches of construction still present challenges to our 2-wheeled vehicles, as they are not laying down asphalt, just more dirt and gravel for the trucks. 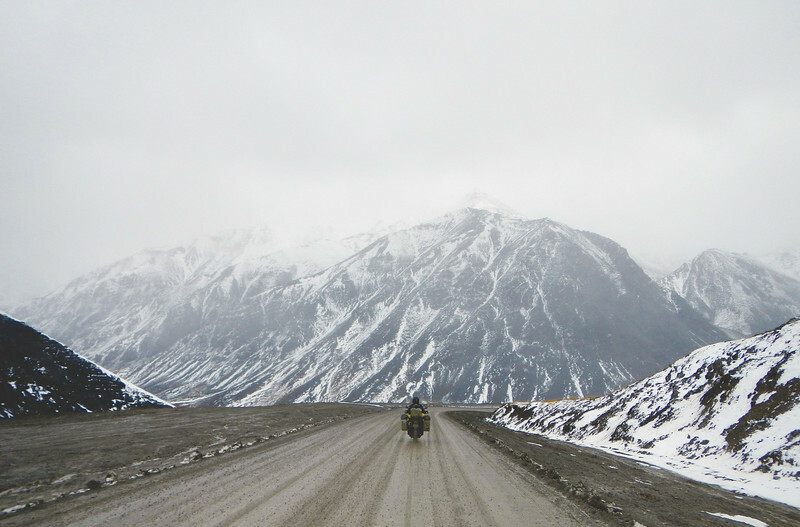 The Dalton Highway was never intended for non-commercial passenger vehicles, and the condition of the road reflects this. In fact, the US government only opened the road to public access as late as 1994. 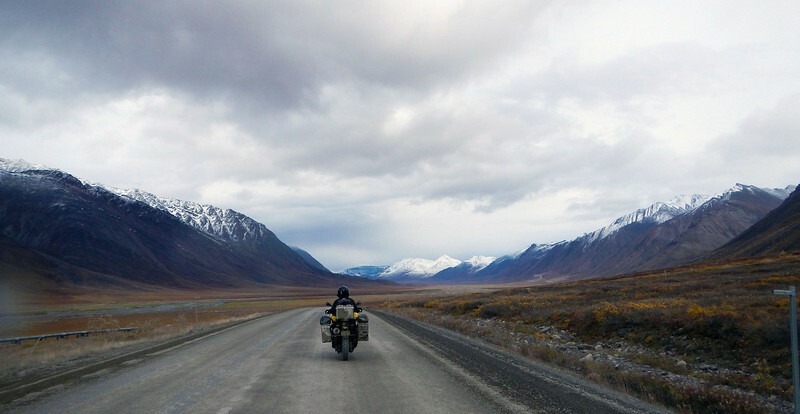 The Brooks Range covers most of Northern Alaska and the Yukon Territory. 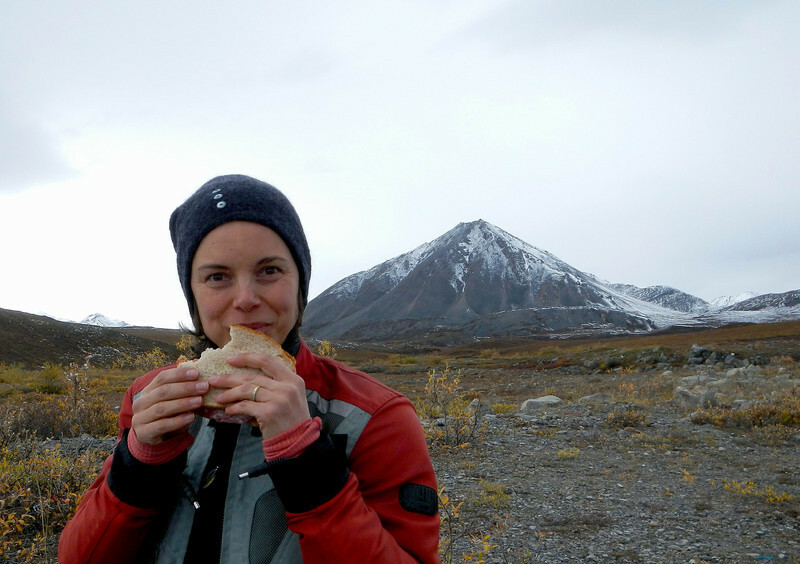 Most of the land north of this mountain range is called the North Slope, as the mountains face north and drain precipitation into the Arctic ocean. 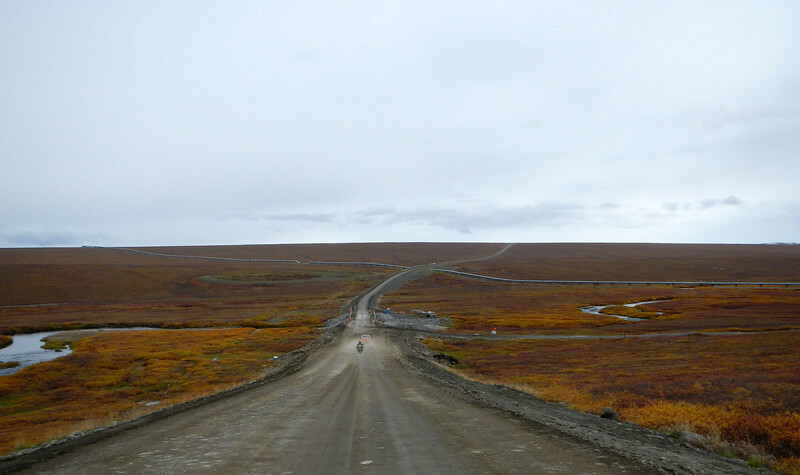 In fact, the original name of the Dalton Highway was called the North Slope Road. 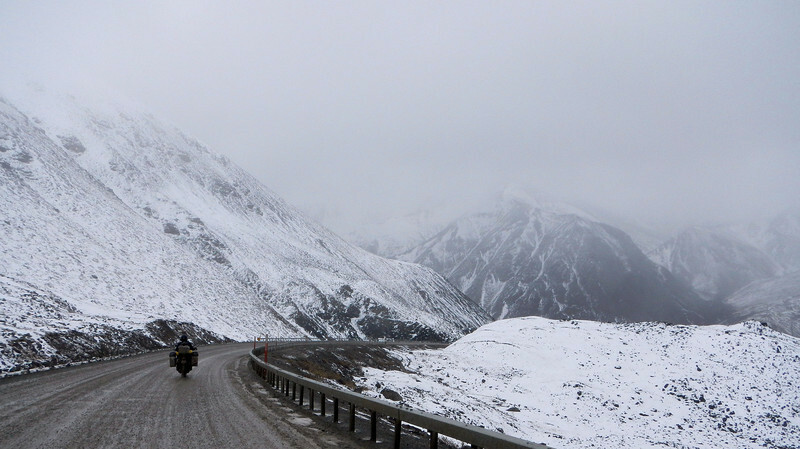 This is where we are introduced to our next Extreme Elimination Challenge: snow and ice on the Atigun Pass. 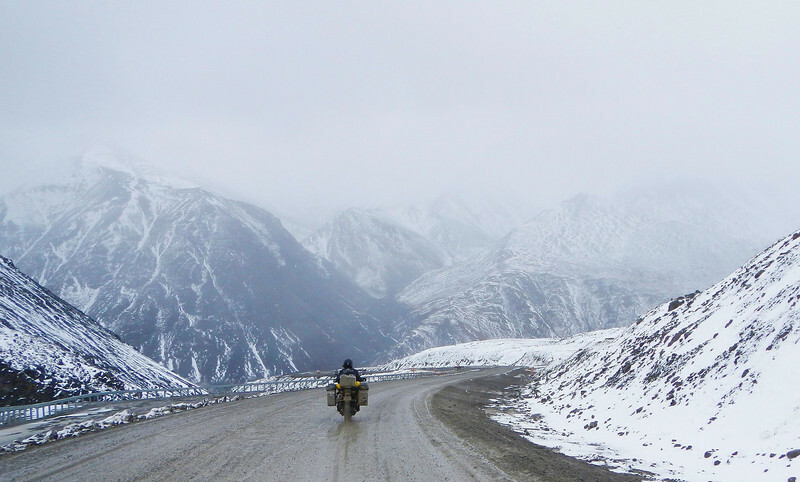 The Atigun Pass climbs 4739 feet above sea level, and as we make the ascent up the wet, gravelly road, we encounter white-out conditions, the shoulders and mountain-sides slowly accumulating with snow. Our speed drops, not only because of the road conditions, but because we are also busy marveling at the amazing views unfolding before us. 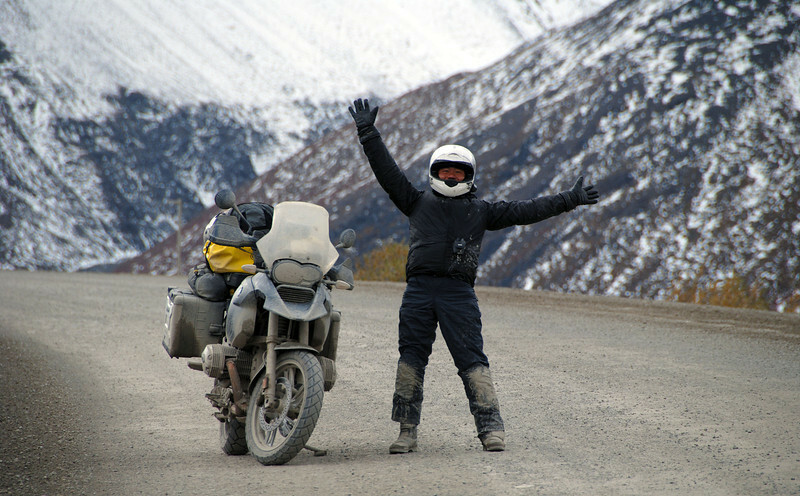 Riding through the snow-covered mountain ranges, the views are amazing! Too bad the road conditions have us scared sleetless. 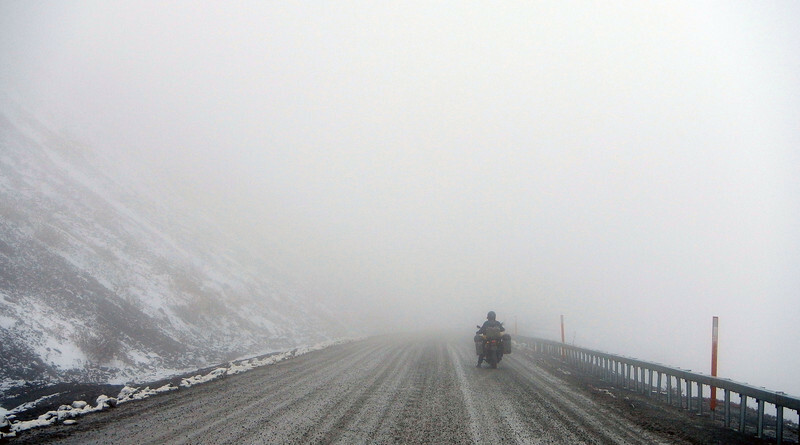 To me, riding the Atigun Pass in a snowstorm has to be the highlight of our trip so far. 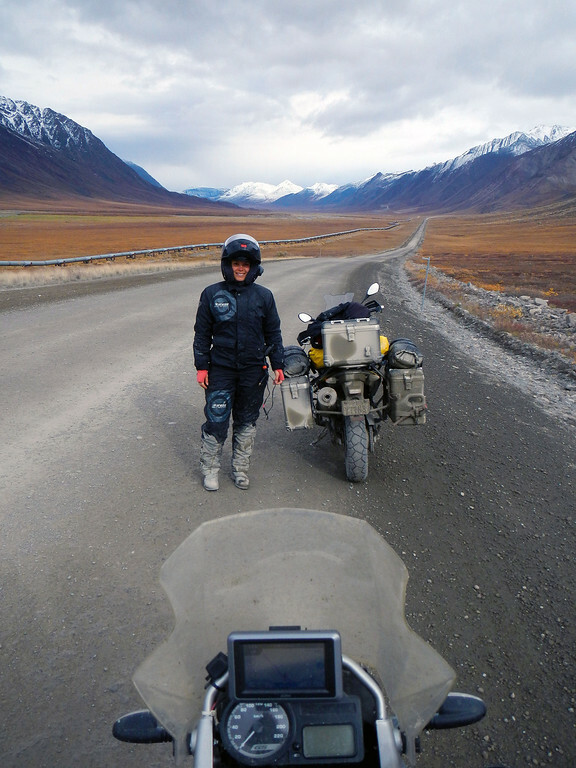 Made it through the Atigun Pass! 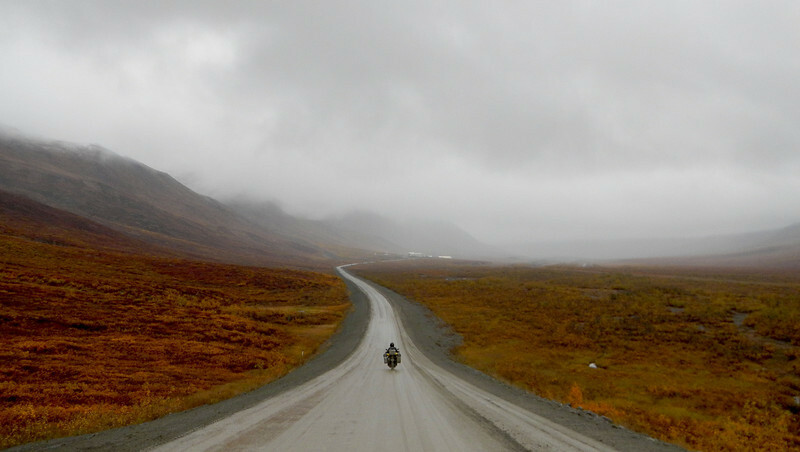 Our preparations for the Dalton Highway were non-existent. We just showed up. 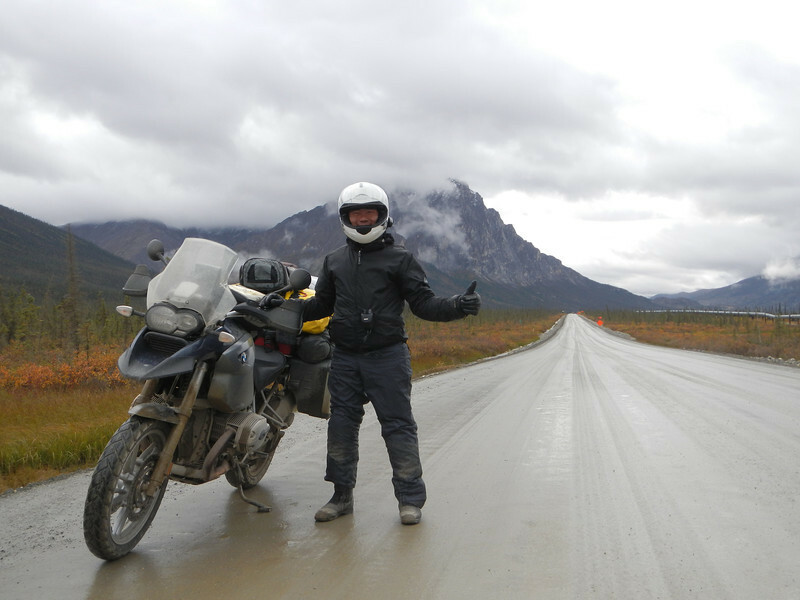 While most motorcyclists donned knobbies or more aggressive tires, we were using Tourances, half-bald from long riding days on the abrasive pavement of the BC and Yukon highways. All the weight on my bike was piled up on my passenger seat and topcase, making my centre of gravity precipitously high and back. While riding the greasy muddy sections, I felt like a tight-rope walker balancing a bowling ball at the top of a long broomstick! At Galbraith Lake, we came up with a solution to my high centre-of-gravity problem. We took all the food out of my topcase. And ate it. Next Extreme Elimination Challenge - "Postprandial somnolence" - rider drowsiness induced by overeating. We found out that construction crews spray Calcium Chloride on the roads. CaCl2 is a thickening agent which thickens the mud and hardens it in the summertime. However, when it gets wet, it produces a slippery clay that when splashed onto hot pipes and radiators, bakes into a ceramic that is impossible to get rid off without a chisel. We are recommended to immediately wash this crap off our bikes before this happens, since CaCl2 is mildly corrosive as well. Often there is a 15-30 minute wait at each construction site. 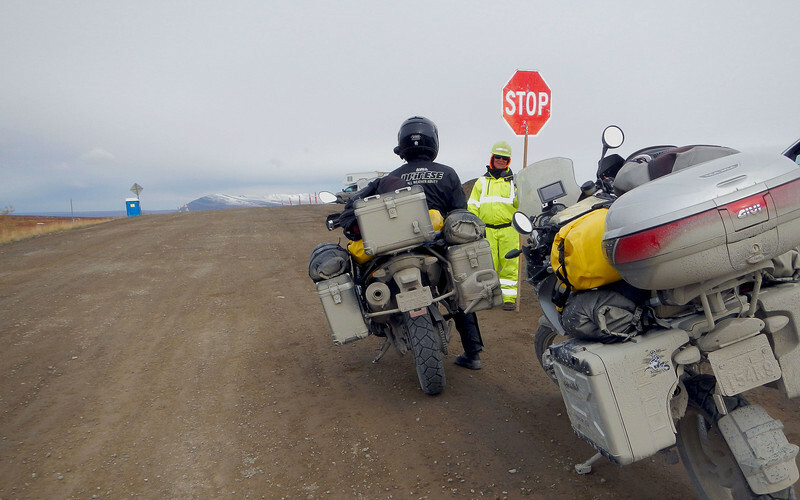 Motorcycles are typically waved to the front, so we got to chat with a lot of the flaggers while waiting for the pilot vehicle. We found out from this flag-person that a stretch of the Dalton was closed a couple of days ago due to snow, so it was fortunate we were arriving today. She told us that while her station was closed, she built a snowman to hold the stop sign, and as it melted, all the construction drivers mocked her snow-flagger for falling asleep on the job! LOL! I leave a healthy distance behind Neda. 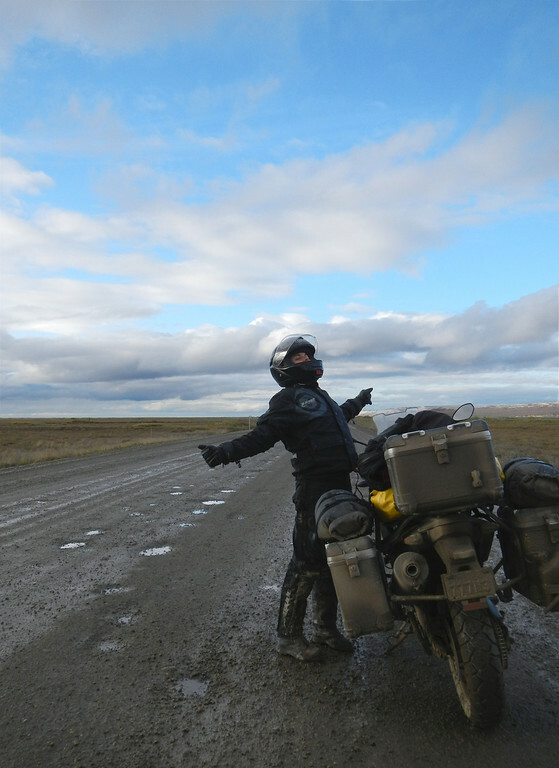 We've found that our dirt bike skills come in handy on this road, and when the road becomes too gnarly and the bikes go sideways, a little throttle helps to keep everything upright and pointed straight. 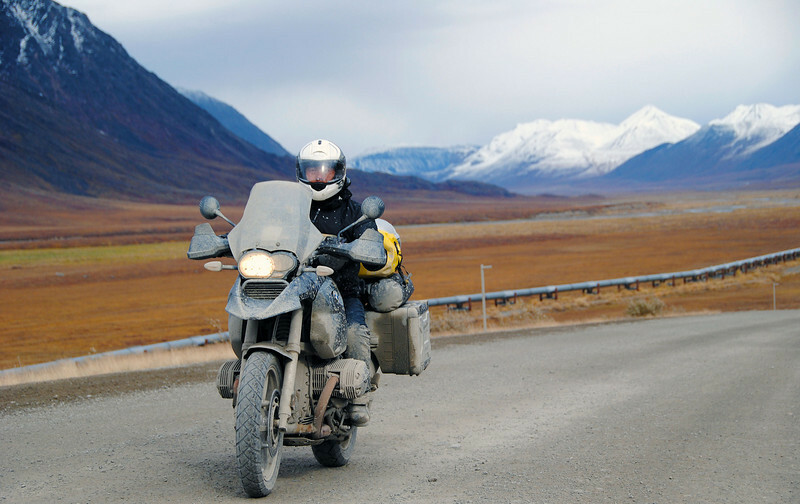 "When in doubt, throttle it out!". Oh and, "DON'T GET ELIMINATED!" 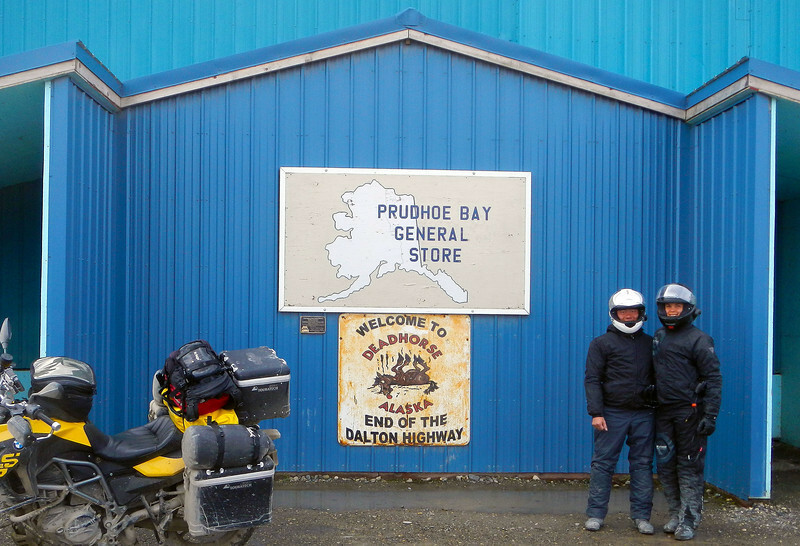 Final stretch (literally and figuratively) before we reach Prudhoe Bay. Happy Valley is at mile marker 334 and the rain starts to let up and we see sun peeking out from the clouds. The mud turns to hard-packed gravel and our speeds pick up a bit. We are sobered up by the sight of a car and a truck overturned in the ditch and we slow down again. Obviously, they too fell victim to complacency on the Haul Road and paid the price. Speaking of which, at a tow-charge of $5/mile, 400 miles north of Fairbanks, I assume it was cheaper leaving the rotting carcasses of their vehicles up here than pay for a tow back to civilization. 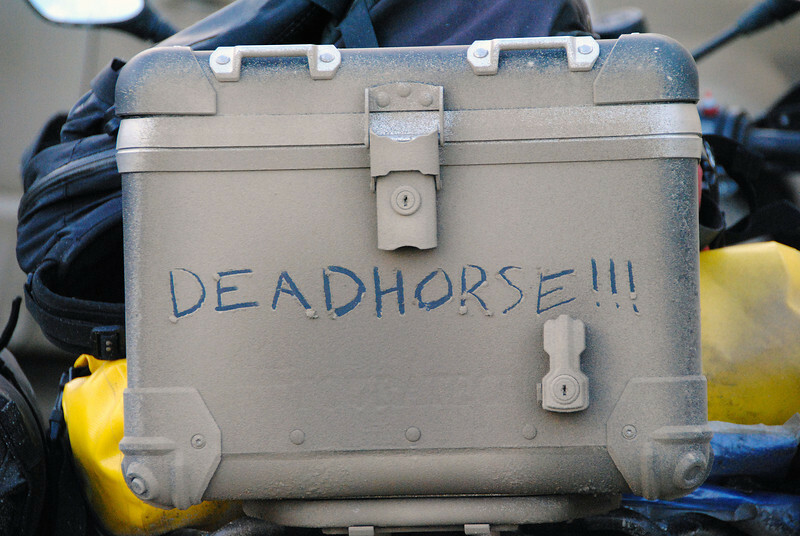 The drilling community of Deadhorse slowly appears on the horizon. It appears slowly because all of the buildings are no more than one-story tall, having been hauled up on the back of an 18-wheeler. 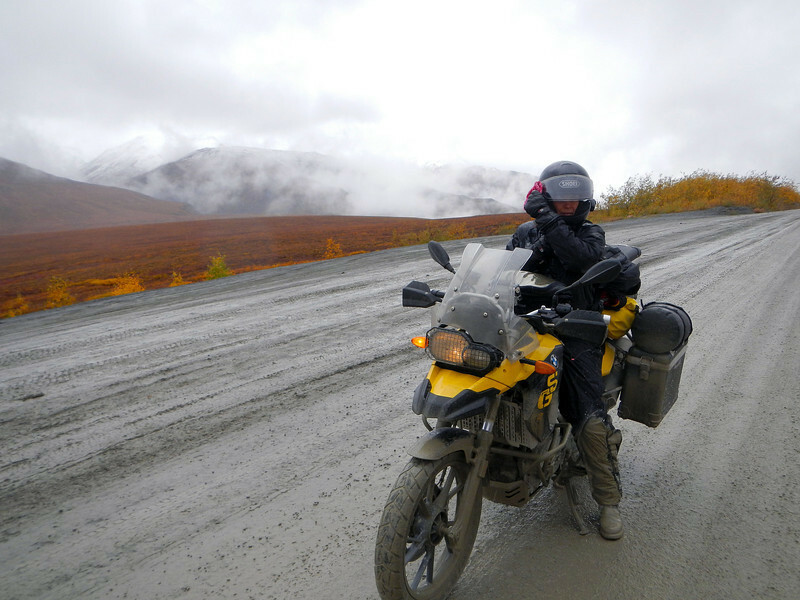 Our relief at reaching the end of the treacherous Dalton Highway is tempered by the fact that we are really only half-way through it. We've got to do it all again to get back to Fairbanks! The weather forecast shows non-stop rain for the next 5 days. 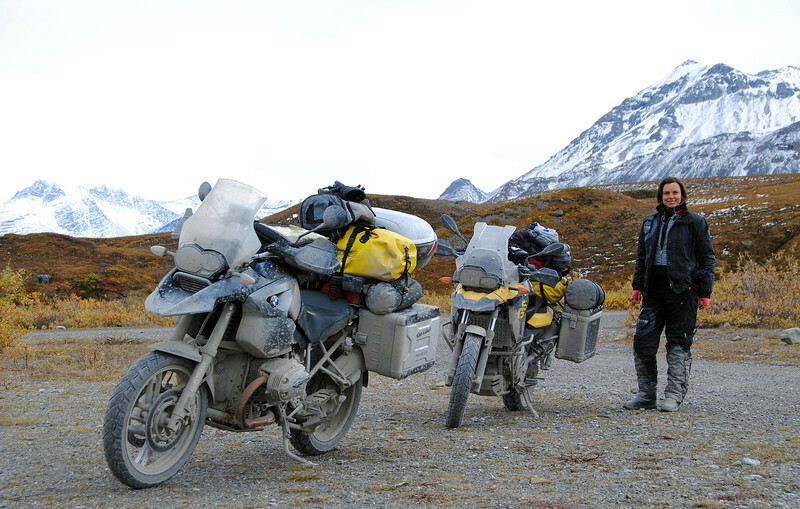 Do we wait and risk snow or ride back in even deeper mud?